It’s no secret that Scottish weather is unpredictable. Many people choose to visit Scotland during the summer months because they believe this is a safer option. However, something magical happens to Scotland in spring. As the wintry weather starts to calm, the days become lighter and new life shoots up in every direction. Barren landscapes, once sugared in snow, are slowly replaced with a blanket of colourful flowers. Dew-soaked grass starts to shimmer in the distant sunlight and the crisp air becomes refreshing. This is one of our favourite times of the year to explore Scotland. 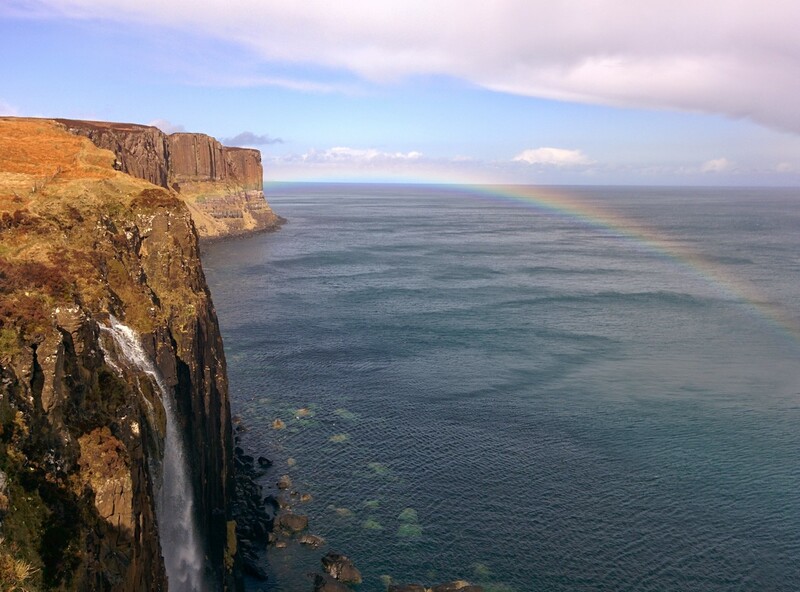 Below are some reasons why we think you will love to visit the Scottish Highlands in spring. Part of Scotland’s charm is its changeable weather. It doesn’t matter what time of the year it is, it is always going to be unpredictable. There really are occasions when you can experience all four seasons in one day, but that is all part of the fun. Statistics show, however, that April and May are often the driest months in Scotland. They are also often the sunniest, especially on the West Coast. Temperatures average between 7? (45?) and 13? (55?) in April and May, making it the perfect time to take that day trip to Skye you have been dreaming about. On bright dewy mornings you can expect brilliant blue skies and warm sunny glows, that highlight the last of the spring snow as it lingers on the mountain tops. The light on offer at this time of the year is a photographer’s dream, particularly in the early evening as the sun begins to set. Many will sit for hours to get a perfect shot of the sun setting behind The Old Man of Storr or to capture the sparkling sun as it dances on the water of Loch Ness. However, please don’t think that you will be disappointed if the weather decides to be less romantic when you visit. Even on foggy mornings and dramatic rainy days, Scotland still manages to turn on the charm with displays of magnificent rainbows or atmospheric clouds weaving their way through castle ruins. Scotland is truly spectacular in any weather but it is wise to keep this saying in mind when packing for your trip: “There is no such thing as bad weather, only bad clothing”. As the weather warms and the days grow longer, the Scottish Highlands start to burst with new life and vibrant colours. You can’t help but feel cheery when you are surrounded by yellow daffodils swaying merrily in the breeze. Not only is the colour yellow said to represent happiness and energy, it is also said to produce a warming affect, and that is always useful here in Scotland. Cherry blossoms, gorse and rhododendron start to bloom just in time to greet the butterflies and the bees. If all of that is not enough to keep you smiling, the sight of spring lambs jumping to and fro in the fields surely will. This delightful buzz of life and energy is truly infectious. After a day taking it all in, we are sure that you will agree. Taking the time to slow down and step back from the rush of everyday life is hugely beneficial for our well-being. A day trip to the Scottish Highlands is an excellent way to do this, no matter what time of year. However, there is nothing quite like the peacefulness of Springtime. Everything is a little bit quieter in Scotland during spring. The roads are quieter and accommodation is much easier to come by. There are much less crowds at this time of the year, allowing you to experience the top sights in a different light. Imagine gazing up towards the mighty Cuillin Mountains without encountering anyone else for miles, or catching a front row view of Kilt Rock’s impressive waterfall as it tumbles down to the Sound of Raasay. Public transport can be trickier out of season but there are plenty of other options available. For example, you could hire a car and explore the popular NC500 route. Alternatively, if you don’t feel comfortable navigating the single track roads, we know a really good company that could take you on a day trip in the Scottish Highlands (hint hint). If personal and peaceful are two words that spring to mind (like what we did there – spring!?) then we think you will love Scotland in the springtime. If you ask any local about Scotland in summer, it is almost certain that you will be presented with a gentle warning about the notorious midge. When the warmer summer weather appears, so too do these tiny little creatures. Don’t let their tininess fool you though, as they can be quite a nuisance. Fortunately, these creatures are nowhere to be seen in spring. You can breathe in the fresh Scottish air without having to worry about inhaling a mass of miniature protein. The midge isn’t all that bad though and it certainly shouldn’t deter you from visiting in summer. They are very much a part of us, whether we like it or not, and one even features on the new Scottish five pound note. There are a whole host of fun events that start to bring Scotland to life in spring. Towns all over the country take part in traditional Highland Games and weekly farmers markets soon begin to line the streets. May is World Whisky Month and what better way is there to celebrate than to go on a Whisky Bus tour or take a day trip to the Highlands & Speyside. May is the perfect time to explore the region that is most famous for producing this fine spirit. The only way you can truly understand the magic of Scotland in spring is to experience it for yourself and, luckily, our tours of the Scottish Highlands from Inverness run from April onwards. So, if you’ve ever dreamt of exploring Scotland, why not join us this spring.